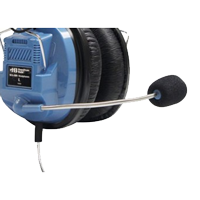 Boom vs. Inline Microphones - Headsets Direct, Inc.
For applications that require speech interaction, you will need to consider choosing between classroom headphones with a boom microphone and those with an inline microphone. A boom microphone is when the mic is attached to the end of a boom, allowing perfect positioning in front of or next to the user’s mouth. This option provides the most accurate and best-quality sound that is possible for your software. The advantage of a classroom headphone with a boom mic is it moves with the user. If they turn their head, the mic remains in perfect position to continuously pick up their voice. Though built to last, boom mics can be damaged, rendering the headset useless. When comparing boom vs. inline microphones, you will also need to consider the cost. With a boom comes slightly higher manufacturing costs with materials and design. You also have more R&D costs involved in developing a boom mic that stays in place, is easily adjustable, and holds up with regular use. 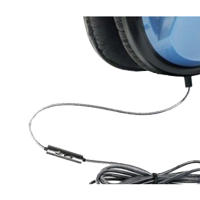 Classroom headphones with inline microphones use a mic that’s built into the cable that hangs between your chin and chest. The advantage of inline microphones are they are more durable, because there is nothing for users to grab or bend. Another advantage is the cost saving of headsets using inline mics. With easier manufacturing and fewer materials comes less cost. The disadvantage of inline mics is the quality of what is picked up and transmitted back to your software. Because the cord with the mic hangs beneath your chin and chest, as the user turns their head, the mic doesn’t turn, making their voice fade in and out. An inline mic will also pick up background noise, because it can’t differentiate between the user’s voice and someone else in close proximity. With boom vs. inline microphones, if you decide your applications require a mic, be sure to take the time, when comparing, to find a suitable solution that meets your needs. It’s very costly and wasted use of time if the wrong device is purchased and re-ordering is required. Take away: Classroom Headphones with boom microphones cost more but are far more accurate and deliver higher quality audio.